Scaling & Root Planing is often referred to as a "deep cleaning", however, it is very different from a routine dental cleaning that only addresses the visible portion of your teeth. Scaling & Root Planing removes plaque and tartar (also known as calculus) from under the gumline and smoothes the root surfaces to promote healing. To ensure your comfort, the procedure is often done under local anesthesia. In some cases, topical antibiotics are used in isolated areas to improve healing after the area is scaled and root planed. In most cases of early gum disease, scaling and root planing in addition to continued daily cleaning at home will achieve a satisfactory result of reversing gum disease. 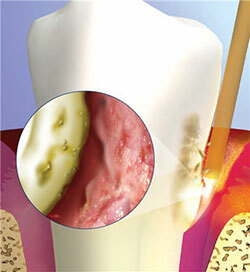 The bacteria that causes periodontal disease can now be tested for and isolated using a simple saliva test. 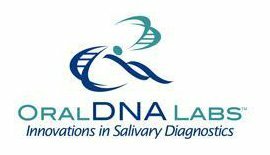 With the detailed report from Oral DNA Labs, we are now able to isolate and quantify periodontal bacteria. Knowing the different types of bacteria that are present and their quantities, we can come up with the most effective treatment plan and evaluate treatment progress better. If your infection has spread into the bone that supports your teeth, and is below the level that can be reached with "Scaling & Root Planing", then a surgical/laser procedure must be performed to retract the gums and remove the lower level infection. With the Periolase® MVP-7, we can now precisely target and remove the diseased tissue, resulting in less post-operative discomfort and a faster recovery time.